Romhacking.net - Review - Outstanding! 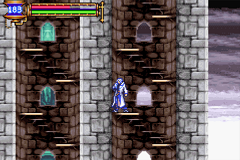 This is the first hack of map and landform for Castlevania Aria of Sorrow in the world. 1. 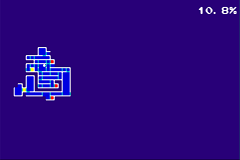 This hack changed many rooms’ landform just like the pictures shows, and also changed the map of all areas. So a new path of full game has been made out. 2. Remake the resistance and weakness for all enemies, the resistance and weakness only related to the area the enemy first appear. All boss just has one or two specific weakness. Don’t miss the weapon which can pick up, otherwise it will difficult for next area. 3. Remake the enemies’ distribution. 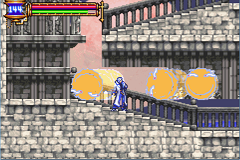 The total amount of enemy increased, but easy to defeat if use the correct weapon. 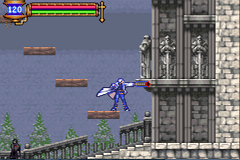 All enemies add the drop object. 4. Remake the weapon system. 5. Increase the limit for red soul in one screen, Soma can throw more red soul at one time. Reinforce some red soul. V1.02 fix some bug: fix game freeze in Castle Corridor; fix bat out of castle in Underground Reservoir; decreases the amount of Zombies in Castle Corridor. V1.03: Fix map to make it authentic. Remove the “Strange transmission” in the game. Move Cemetery to the air so that Cemetery still need transmission from “five-pointed star”. Reduce the HP of Chaos boss and Gargoyle. 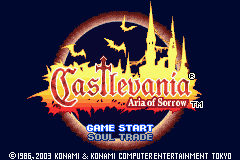 name "Castlevania - Aria of Sorrow (USA).gba"
This is quite the accomplishment! I am very much enjoying it so far. The new map layout and other additions give the game a whole new feel. It can be difficult at times, but not impossible. Can’t wait to get back to it! Very well done!